When selecting entertainment for your corporate event in Chicago or the surrounding suburbs such as Lincolnshire, you have many choices. There are numerous cover bands, tribute shows and entertainers to consider. However, when seeking live music that is going to appeal to all of your guests as well as be interactive, then our Dueling Piano show is certainly an option to consider. In turn, there are many versions and different acts to choose from when booking dueling pianos in the Chicago area and being certain you’re picking the biggest name in the business is paramount. 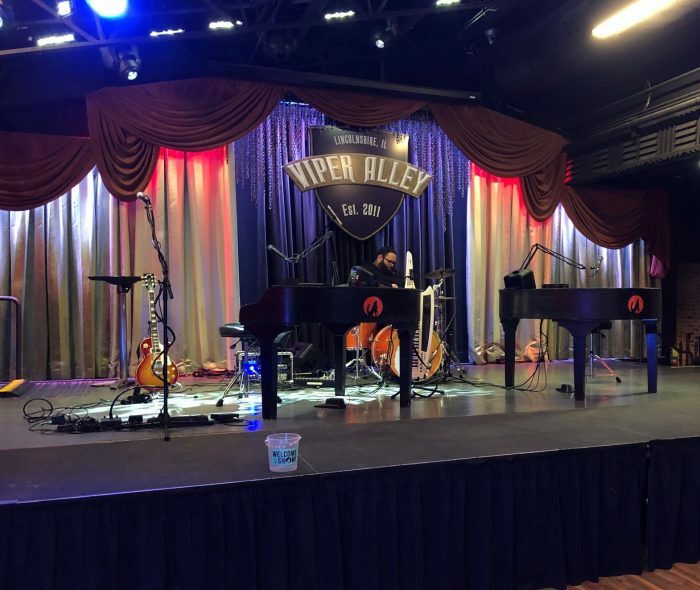 We have brought our show to the Viper Alley for a variety of clients, including an annual holiday party for Grainger which is always a party we look forward to! Viper Alley is unlike anywhere that you’ve ever been before. Imagine if an impressive event space and a bowling alley came together to create a unique atmosphere where guests can both have fun and celebrate a special event. What you would be imagining is Viper Alley. Viper Alley is the perfect place to host any kind of major event, like a fundraiser, corporate event, trade show, team building event or even a lovely wedding. Because of the size of the space, up to 650 people can enjoy your event…and Viper Alley can even provide delicious catering options for all of them! Viper Alley has in-house production capabilities and a stage, making it easy to entertain, inform and interact with guests. For both casual and upscale environment for your next major event, make sure you consider Viper Alley. Your guests will have a great time, and you’ll create an unforgettable memory. Booking Howl2GO Dueling Pianos’ world class show to your Lincolnshire, IL event couldn’t be simpler. From conventions to corporate events, weddings to fundraisers, our unbeatable Dueling Piano shows bring a high energy, interactive show that your guests will remember for years to come anywhere in Illinois!